The Fascinating Origin of the Word "Abracadabra"
The malady the Greeks call hemitritaeos is more deadly. None of our ancestors could name this disease in our own language, nor did they feel the need to. On a piece of parchment, write the so-called ‘abracadabra’ several times, repeating it on the line below; but take off the end, so that gradually individual letters, which you will take away each time, are missing from the word. Continue until the (last) letter makes the apex of a cone. Remember to wind this with linen and hang it around the neck. Many people say that the lard of a lion is effective . . .
Alternatively, the word might be derived from the Hebrew words for “father, son, and holy spirit”: “ab, ben, and ruach hakodesh” respectively. Perhaps more intuitively, it could be derived from and Aramaic phrase “avra kadavra.” Harry Potter fans will likely know that this is what JK Rowling used when she was coming up with the killing curse “avada kedavra.” In an interview, she stated that the original phrase meant “let the thing be destroyed,” (more on this in the Bonus Facts below) which would suit the cure-theory well; abracadabra was written to “destroy” the sickness. How the poor People found the Insufficiency of those things, and how many of them were afterwards carried away in the Dead-Carts. “Presto” simply means “quickly” in Italian. It was used by magicians who were attempting to call up demons and apparently wanted them to hurry up. The phrase “avra kadavra” does not translate to “It will be created with my words” but rather literally “I will create it, as per command” or more colloquially “What you command, I will create”. The word “avra” is the future first-person tense of “bore”, or to create, and therefor “I will create”. The word “kadavra” is composed of the prefix “ka” or “as per”, and the word “davra” which is “command”. The word “bore” will be familiar to those who know Hebrew prayer, for instance “bore pri hagefen” or “Creater of the fruit of the vine”. The prefix “ka” is used all over the place in the Old Testament. The word “davra” is how the Ten Commandments are referred to in Hebrew. Source: native Hebrew speaker, though the words likely came to English through Aramaic. @Dotan Cohen: Good stuff, thanks Dotan. I basically agree with Daven. My only question is whether it might also mean I will create according to my words. Since this is magic, the magician may take upon himself the role of creator. The Hebrew Wikipedia says. “אברא כדברא” – שיברא כדבריי (abracadabra = syevarah cdiborah); roughly translated Abracadabra means I will create according to the words. This is an illusion to the creation where the Lord spoke and the creation came into being. The phrase enhances the power of the magician or healer who uses it. (I’m paraphrasing here … this was a discussion back in June, after a long week of conference sessions). It’s possible that you’re missing a critical step in the etymology, if English got the word from Russian … which may have derived from something else. My legal name is Abra Cadabra and it only means that I am Lynn Cadabra’s husband! The words abracadabra means “make a corpse”. That is the way I understood it in my studies of theology and the occult. It is like wishing someone would die. Interesting stuff. In J.E. Cirlot’s “Dictionary of Symbols” he claims that the magic word likely comes from a Hebrew phrase “abreq ad habra”, meaning “hurl your thunderbolt even unto death”. I’m curious to know the truthfulness of that, now. He also briefly mentions abraxax. remember to the scripture “I can do all things through Christ who strengthens me” with him all things are possible..
see the work he does in me! the cadavera was “the sacrificial body”, provided to his will. the amulet means: “I submit to the will of Christ”..
At the time of the reformation Protestants translated the Bible into vernacular languages and saw the use of Latin by the Roman Catholic Church as a mechanism for restricting access to the divine through superstition. “Hocus pocus” was a mocking version of Latin words from the Catholic mass used to ridicule what they perceived as a fraudulent ritual which as become associated any form of hoax or illusion. Abracadabra means, as many have mentioned, “I create AS I speak”. And prior to speech, one has “thought”. A “thought” thusly spoken has more CREATIVE power than the thought alone. Rene Descartes had this world of creation flipped backwards with his famous statement “I think, therefore I am”. You “ARE” prior to, in between, and after your “thoughts”. In other words, your “I Am’ness” stands before, after and apart from thought. Thus, turning DesCartes famous quote on its head, we have “I Am what I think”. 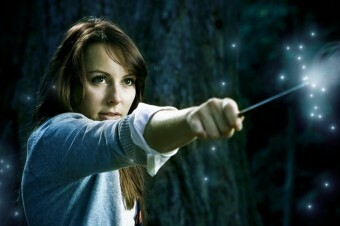 Which leads us to the apparent “magic” of the word “Abracadabra” – “I create what I think I am as I think/speak”. And so it is. The “magic” is in you, in your thoughts. Always and forever in this realm. Who you say you are, what you say the world is, is who you appear to be and what the world appears to be to you. Thus, abracadabra is the creative power of the human mind and tongue. Change your thoughts, change your words and you change yourself and the world around you. So technically in ages past Abracadabra/ Avada Kedavra – since they seem to share their origin – could have been used for anything from felling a tree to healing someone… until someone decided to try and use it on a hunt and found out it could be used to kill animals (and by extension humans, they did not like). So other spells might only have been invented once this change had happened. Interesting. The word abracadabra derives from Aramic , a semitic language. The world is a compound one made up of three words, abra, ca, and dabra. In arabic which is a sister of Aramic the word abra means create, ca means as and dabra means plan or manage. I learned many years ago, perhaps the 70’s, that it was of Sufi origin. The story I heard was that it was a Semitic spell: “Abrada ka dabra” meaning, “May it perish like wind”. The speaker repeated it, each time deleting the last syllable, till only the initial “a” was left. At that, the evil it was directed at was supposed to have been dissipated.